QuoteWerks has a powerful built-in Management Reporting tool which offers Users features and functionality to be able to write detailed and summary reports. It is also possible to export data from the reports for further analysis in another reporting tool. However, QuoteWerks Management Reporting tool only allows for text-based reports across Documents or Products and graphical reporting is not supported at all. With QuoteWerks’ open database, it is possible to bolt on third party data mining tools such as Crystal Reports, SQL Server Reporting Services or Power BI. These however come at an additional cost and can involve a considerable learning curve, depending on the User’s database / technical experience. 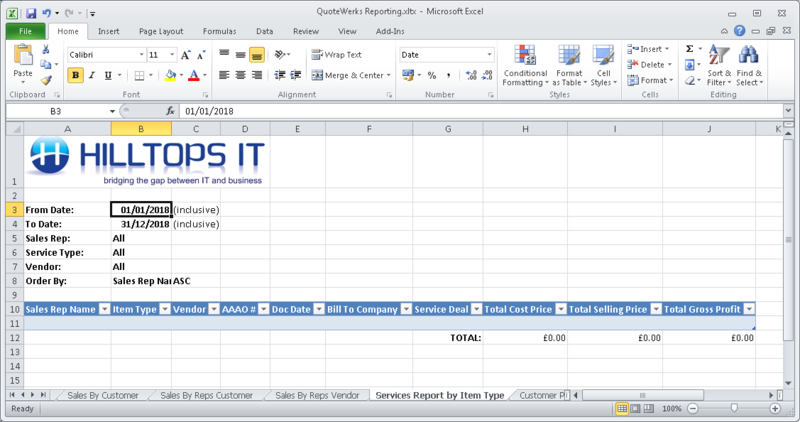 We have found for many QuoteWerks Users that having a template report set up in Excel which they can just set a few filters for and refresh is a far easier, less expensive and more intuitive method - Microsoft Excel is very commonly already installed on the User workstation and it is a tool that the User is familiar with. Data may be refreshed quickly and easily into a pre-formatted text and/or graphical report. All of the reporting capabilities of QuoteWerks plus reporting across Vendors and other tables not available to the default Report Management area. All of Excel’s features to allow for analysis and additional manipulation. Customisation to reflect your corporate brand image. A familiar environment for Users to work in. Excel comes at relatively low (if not zero!) cost. Data is faster and more reliably exported for analysis and further manipulation. Does not require a QuoteWerks license for Users to access the reports.